If I ever joined a cult, it would be because Bre told me to. I don't know why but she has this ability to tell you about things, non-forcefully, and then you are like, yes, I must try or do that thing. See: bujo-ing and all the crap I have bought because of it. And watching I'm Sorry again. And Add It To My List. She is doing a "Last Week Tonight" post each week and of course it makes me want to share the things I like, too. So here are consumables that I have been loving that don't cost extra money, assuming you have library access/streaming services/a way to listen to podcasts. This American Life - Beware the Jabberwock - I love TAL but some eps are better than others. This one totally fascinated me by telling me more about a name I have heard from twitter - Alex Jones - and how he came to be, and why he is so problematic. Like I could have told you before that he was awful, but now I can pinpoint exactly what he has done that was bad and speculate on how it came to be. Conan O'Brien Needs A Friend - Pretty sure Bre rec'd this too but we share a love of good ole Coco. Even the ads on this are funny ("Conan O'Brien pays off the mortgage on his beach house..." complete with bird sounds in the background). Conan interviews celebrity guests to see if they could be friends but asks really entertaining questions and lets them shine without taking over. Also, his assistant Sona keeps him grounded in reality and calls him out in perfect ways. This one is great, especially the ep with Michelle Obama. Superstore is a show I never expected to like. I don't love sitcoms. However, I was bored and a friend recommended this and I like America Ferrera so why not? This is a sitcom in a workplace with some unrequited love and long-running jokes, but it also brings light to illegal immigration status, maternity leave (or lack thereof), women's rights, and other issues without being too preachy. Plus it often makes me LOL. Shrill had to make my list because I love Lindy West so much. But really, as someone who has never felt thin but is not plus-sized, I found SO MUCH of this show relatable, and I'm sure women of all sizes do, too. (The first scene where she is stuck in the shirt...). It is what Girls could have been if the characters weren't terrible. Was Annie always likeable? No. Did I like the last episode? No. Is the book better? Of course. But I loved so many parts of this show, including Annie's roommate, who was the BEST. The new season of Queer Eye is so, so good. The one where they record the guy saying bad things about himself and play it back for him and then the one with the young, black, lesbian women were my favorites and both had things that I wanted to write down and nod my head to. My favorite, Nora McInerny, wrote another memoir called No Happy Endings about life after her husband died of cancer. This time, we get to see her grief as she raises their son, falls in love again, and gets pregnant while getting two bonus kids from her now-husband. It's a lot, but if you truly like to see how another person navigates life, it is 1000% worth your time. Allow me to be the 47th person to tell you to read Michelle Obama's book, Becoming. I really loved it. I really liked Pachinko, which has been around a while, but if you haven't read it, I really recommend it. It is the story of one family, through generations, and with the backdrop of the Korean/Japanese conflict that I honestly knew nothing about. It really hits on the fact that so many emotions are universal, regardless of when or where they happen. TL;DR - just consume all these things. What's new with me is that I miss the connection of internet friends. Also, recently, the idea of vulnerability keeps creeping up - in my work life, from Brene Brown on instagram, and from my therapist, which is what made me really listen. (Lauren, you have a therapist? Yup - vulnerability in sharing, y'all). I feel like those two are tied together - my fear of being vulnerable on the internet can make me, well, somewhat uninteresting. If I am not sharing my whole self, then what is left to read? Anyway, like many others, I can wax poetic about the good days of blogging circa 2013 - no shade, I like to know I'm not alone - and I can also try to do something about it. So here I am, linking up with Kristen, and hoping some people who are just regular women with no intention of being an #influencer come around and read paragraphs and don't mind a lack of pictures. So - what's new with me since I actually wrote a blog post with some feelings? I'm working on being nicer to me. Did you see that episode of Queer Eye in season three where they recorded all the bad things the guy said about himself and then Karamo made him listen to it? That was SO resonant with me. I may not say them aloud, but how many times a day do I judge myself, or think that others will? How much negativity am I spreading internally? Whoa. So that led me to writing down daily gratitude. Yes, I have scoffed at it before, so if that is you, I totally get it. But, it gives me a reason to visit my bullet journal daily and it can be as simple as how fantastic the perfectly ripe pineapple I just ate was. All it takes is one little thing. On the life front, I am working to straddle the line between Instagram makes me want to buy everything and not being a mindless consumer. For example, if you listen to my Instagram stories, you know I have recently discovered this store called Dirt Cheap which has Target stuff at HUGE discounts. I will go in there and be like "hmmm, well, this vase is cute and SO CHEAP" and have it in my cart, but then think... why? Why do I need another vase? Is it sparking joy? Usually no - I usually get my joy in "things" from quirky knickknacks found in antique malls - and I am able to put it back. I mean yes, the thing is cheaper than my average Starbucks, but do I need MORE STUFF? Mostly, the answer is no. However, after living in our house four years, I am finally working to make some of our spaces more home-y and adult - a rug under our bed, finally hanging some art in the bathroom, and buying a concert poster with no idea where to hang it mostly because I was in love with it. (It's an Avett Brothers poster with an astronaut riding an armadillo and it was perfectly Houston. I had to.) I guess my personal line is that if it will make me feel a way - comforted, pull up a memory, etc - then I am more than willing to consume. And finally, vulnerability. I mentioned that before. I wrote the aforementioned paragraph and thought about how I would love to connect with some new, regular women who blog or read blogs, and how maybe they love to consume things and it brings them joy, and I wanted to rewrite everything I said. I don't want to hurt feelings. But I have to own what I think, try to articulate it, and accept when I'm wrong, or at least honor a difference of opinion. I have secretly wanted to be perfect in so many ways while trying to tell myself I didn't care what other people think for SO LONG, and it's exhausting. So, to put it all out there, and in the words of John Mayer, "just wanna be liked, just wanna be funny... looks like the joke's on me, so call me Captain Backfire." Not being my full self wasn't me enough, so it's a thing I'm looking to change. Trying to be more moderate and not piss people off worked in a way but was a disservice to me. I like to read real thoughts and feelings and see what everyone else is going through, but all I can control is what I put out there, and I am going to work to make that much more honest and vulnerable. SO anyway, if you are new here and made it through that, you might be my kind of people. I am much more likely to post on Instagram than keep blogging going, but if you like blogs, I already have half a post drafted which is more than I blogged all of last month. Cheers to working on you, reading about real people, and killing time on the internet. Bre wanted to write an add it to my list post on the same day but not do a link-up because one of our many traits in common is apathy to additional work, so here we are. Bre is also the enabler-in-chief so if she suggests I do something or buy something, I probably will. I consider it my implicit trust in her judgement (except for adult cartoons. I have to draw the line somewhere). Anyway, to refresh your memory, Add It To My List came from the fact that I love telling people what to buy or consume in real life, so with this post, I can take that love onto the internet. So, here are some things I have enjoyed lately, broken down by things that cost nothing (and won't add to physical clutter for all of you who have Kondo'd recently), things that are really cheap (~$5), and things that cost a little more. Cold (podcast) - I guess I am fortunate to have not lived a hard life and to be able to listen to podcasts about difficult subjects. This one is about Susan Powell, a woman whose husband was suspected of her murder after she disappeared. There are so many weird, messed up details and many of the major people in the story kept diaries, plus there are police tape, so it is really well put-together listening. I'm not fully caught up and a few things drag, but I would recommend it if you like podcasts that focus on one case. Believed (podcast) - This one is also hard to listen to, but I got sucked in while in my car solo on a four hour drive, so the eps just kept playing. It's about Larry Nassar. Nothing is sugar-coated, but it isn't exploited, either. There is enough info for you to CLEARLY understand that he was a criminal, but his acts aren't the focus; his survivors are. So You Want to Talk About Race - putting this on the free list since I am all about libraries, but this one is worth your money. If you consider yourself a white ally but still have a hard time in conversations about affirmative action, or why there is no white history month, or other some such nonsense that you KNOW is ridiculous but you can't articulate why when approached with such ignorance, you need to read this book. Even if you know those things, or if you are a person of color, you would probably get something from it. I loved it. If nothing else, follow the author on twitter. Homemade Medicine Balls! - Thanks to Leslie, I learned that you can make a Starbucks medicine ball at home. I was sick during the Christmas season and spent a small fortune on these at Starbucks. No idea if they actually work, but they taste good and make a nice work-time treat. For the uninitiated, it's a combo of boiling water and lemonade with peach tranquility tea and jade citrus mint tea, plus a touch of honey. Fifteen tea bags are around $5 and you can get them at Target, so the start-up cost to make these is higher than $5 but they save money in the longrun. Face mask spatula - Bre told me this existed and I went to buy it that day. If you have facemasks that are in large tubes for multiple uses, these are amazing! It helps you apply the mask evenly, keeps your hands cleaner, and honestly just feels fancier. I got mine at Walmart for like, $2 but this Target one came up first on google. Buying used - I bought a dresser from Joss & Main or Wayfair or something like that last year. I hated assembling it, and only two of the six drawers work correctly. I got some barstools that needed assembly from Target for Christmas. One of them is a bit wobbly. I realized I don't have this problem when I buy pre-loved furniture from my beloved antique malls. I got a lovely 1940s kitchen cabinet this weekend, no assembly required, plus I love that it was previously-loved and better for the Earth. Stickers - So in #bujo/planner world, there is this company called The Happy Planner and they put out sticker books that are like, $20 each before coupons. Every few months, there is a new release and "planner girls" (yes, this is a thing) swarm Michael's/Hobby Lobby/JoAnn to get the latest stuff because sometimes, the best books disappear, never to be found again. Instagram FOMO is real. So this release happened and the Instagram flip-throughs were everywhere and there were two stickers books I needed. Picture me, at Hobby Lobby at 10 a.m., digging through boxes of not-yet-out merchandise to find my two books, and then asking my planner friends on facebook if anyone needs anything. While I was waiting for my answer, two more ladies came down the aisle and stopped at the empty pegs where the stickers should have been and seemed disappointed. I pointed them to the boxes to dig through and their morning was made. I never expected to bond with strangers over stickers as a grown woman, but here we are. The point here is if something dumb makes you happy, just get it... (and if you want to see how I use them, @brunchandbujo on instagram). Carry-on Luggage with spinner wheels - I travel solo pretty frequently and can't expense a checked bag unless it's a long trip (nor do I want to anymore). I have a leather tote I use for my laptop and purse essentials, and then I make my way through the airport with my carry-on. I used to have a cheap one that I thought was fine - my bag could get pulled behind me, no big deal. But, I upgraded once I started traveling for work and being able to keep my bag upright in front of me with my laptop bag on top seems to weirdly simplify everything. I move down the plane aisle better, I can navigate through crowded airports faster, and it just feels easier. I got Andrew and I each a Samsonite at Ross for around $60, which is baggage fees for one round-trip flight, so definitely worth the money if you can pack light! Houston restaurants that should be on your list: Morningstar (pancake balls! ), Indianola (get the ham appetizer, and I don't even like ham), and Theodore Rex (it makes me happy every single trip). That's my list lately - or at least, things I haven't already shared on instagram. Not real languages. If you take this literally, than everything but English would be on this list. Spanish would get an asterisk. I can at least kind of understand and read that. I'm talking more about pop culture languages. Things that other people slip into conversation and make reference to and others just get it while you smile and nod. Rent Live was all over my twitter feed the other night, and in the nicest way possible, I just didn't care. I mean I'm sure it's great and I know it was groundbreaking but I don't speak Broadway. I saw Wicked in NYC and Avenue Q when it came here and that's it. I didn't grow up with showtunes, wasn't a theatre kid, and it's just a whole world that exists that I don't understand. What are some things you know nothing about, or "languages" you don't speak. I have a friend who doesn't speak Harry Potter which I at least learned long ago and can usually reference quite well. OH and Bre and I are going to do Add It To My List, just as a post, not as a link-up, the last Tuesday in February so put that in your bujo and prepare! Sign me up alongside the loooong list of bloggers who have abandoned daily trips into the lives of others for one reason or another. Blame time, blame instagram stories, blame laziness. All are accurate. I started bullet journaling in summer of 2017 and have done it off-and-on but mostly on ever since. I have a separate instagram account for it (@brunchandbujo) because grown women posting about pens and stickers is fun for me, as is having an excuse to get together with girlfriends over brunch to ooh and aah over each other's pens and stickers and also meet people I wouldn't know otherwise. If you need something that makes you feel marginally crafty and can document whatever you need to document, I recommend it. But that was my really long way to say that bullet journaling a) documents how I spend my time and b) provides me with social time I was looking for in blog life. So, there's that. I can't believe that I've been at my current job and have worked from home for two years in a few weeks. No traffic, no real clothes, no coworkers (what is with me and this sentence formatting? I guess in not blogging, I have also forgotten how to write). But it's been two years of growing professionally and personally and improving my confidence in ways I didn't know I needed. Not all days are good but a lot of them are and I am truly grateful for my professional life more often than not. Through work, I'm doing an Identity Development... thing. Like, working at a progressive non-profit, race, class, and privilege are something that are common in conversation. I check in-person programming for representation and took "ladies and gentlemen" out of a program today for non-binary inclusion. So, in that work, I am reading a book on race in the classroom (Courageous Conversations About Race, if you're interested, which I have thoughts on) and having near weekly conversations about it with my small group. And from that, I want to hear more voices not like my own. I'm trying to listen to podcasts by or about people not like me, and read books by people who don't look like me. Even fiction with Asian American characters counts. But anyway, it was an opportunity that was presented to me and I wanted to say no because it's extra work but I said yes and I am glad I did. Um, so what else? I do miss talking books which I decided to highlight on Instagram stories because a simple sentence and screenshot is easier than coherent thoughts, which is honestly the opposite of the point of reading. TV is still my first love but finding shows to watch alongside my husband is a chore. I am watching season three of True Detective with him now, which is interesting, and our old standby Top Chef. We're watching Succession on HBO but I don't love it. I like Kieran Culkin's character enough to keep coming back, though. Halt and Catch Fire and The Americans were my favorite TV moments of 2018, I think, so those are my current recs. Maybe I should do an entertainment post once a month like Bre does because it is fun. I also miss adding thing to my list. 2018 was the year of skincare for me. Like, moisturizing more days than not and finding value in undereye cream. I am also on the jade roller bandwagon simple because it feels good and it was $15 and that is all I need to know. A friend gifted me Birchbox for my birthday and it's a great $10 per month if you have it to spare on a little surprise for yourself. I store my samples in a caboodle (they're back, y'all) and make sure I use something from it at least once a week, whether it's MAC mascara when I am going out or a facemask at night. And I track that in my bullet journal as self-care. It's all cyclical, y'all. Hmmm, what else? Drinks. Those feel important. I finally acquired a taste for La Croix after many years of trying. Andrew and I have been drinking hot tea at night instead of dessert as the caffeine doesn't impact either of us and I like that, too, after a lifetime of being a tea hater unless I was sick. And I got a Nespresso for Christmas and it's life-changing and delicious, albeit totally unnecessary. But, it saves me from cleaning the coffee maker and "having" to go to Starbucks. So needless to say, I am starting 2019 super hydrated, if nothing else. In 2018, I tried to focus on being intentional and I want to carry that into 2019. I'm not doing the best with friendships and relationships, so that is a place to start. Reaching out and making plans, asking questions, and being there. 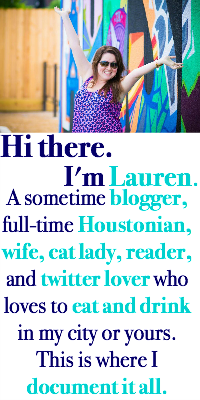 Blogging at least quarterly to justify a part of paying to keep my custom URL and use the hashtag houstonblogger on instagram should be on that list, too. Cheers to my best intentions.